Beer is the world's most popular beverage. If you stacked all the beer cans consumed in the United States each year, they could reach the moon 20 times! We all know someone who we think could single-handedly contribute to at least one of those trips to the moon; our Beer Pint Trophy is a perfect gift item for that beer fanatic in your life. 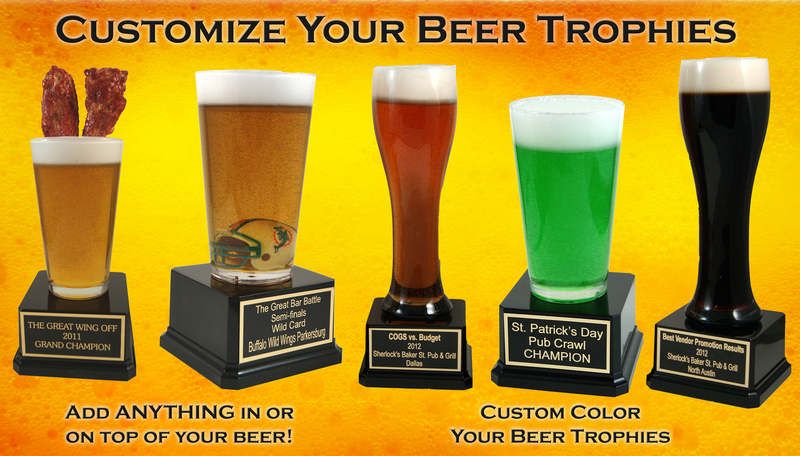 Our beer trophies look so real, you'll want to drink them. Our beer awards are made by hand and can be custom colored, so if you prefer a chocolate stout, amber lager, or are looking to match a specific brew, that is no problem! You can also have any item inserted inside the beer or on top of the foam, like in our Chicken Wing Trophy or Bass Fishing Beer Pint. We even have a Beer Plaque for you to hang proudly above your office desk! For larger orders we can have your logo printed directly onto the glassware itself, but even for individual orders, your logo/artwork can always be printed/engraved on the nameplate. If you have something Far Out in mind and want a Custom award, just Contact Us and we will bring your award to life!